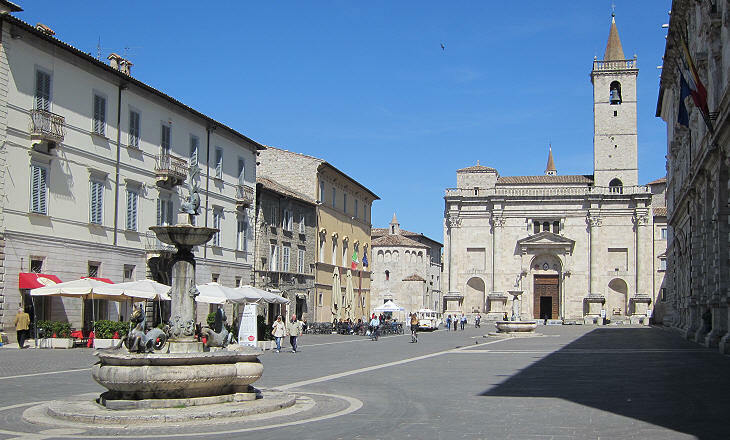 Piazza del Popolo is situated in the very centre of the town near the junction between its two main streets. Today it is the salotto (sitting room) of Ascoli where its inhabitants go to have a chat and relax at one of its cafés, but historically it was a marketplace. It was entirely redesigned at the beginning of the XVIth century when porches were built on its two long sides. Two popes are among the regular customers of Piazza del Popolo; for more than two centuries they could talk to a bronze statue of Pope Gregory XIII which was placed at the centre of the piazza. In 1798 the French melted it to make guns with its bronze. The two monuments are very similar, but that to Pope Paul III which was built some forty years after the other one has a more harmonious design which is based on that of a triumphal arch. It is called serliana because it was suggested as an example to follow by Sebastiano Serlio in his treatise of architecture. The Canopus at Villa Adriana and the Temple to Hadrian at Efeso are precedents of serliana in ancient monuments. Capitano del Popolo was a magistrate at the time Ascoli was a Comune, a city state. In 1535 the palace was rebuilt after a fire caused extensive damage and in 1564 it became the residence of the Legato, the governor of the town and eventually of the whole district. 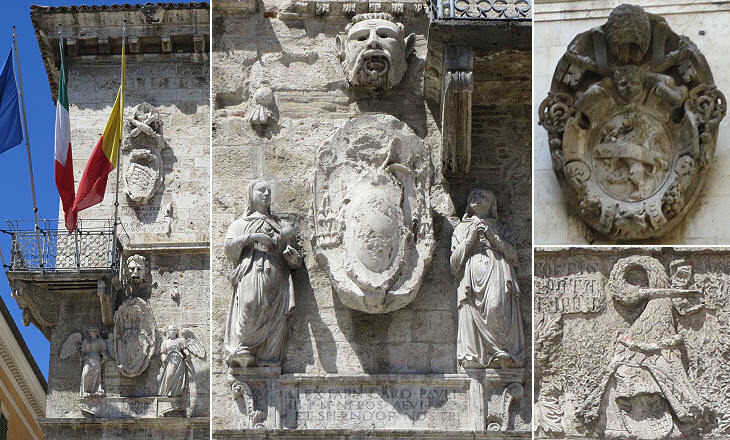 For this reason it was decorated with many coats of arms of popes and cardinals. 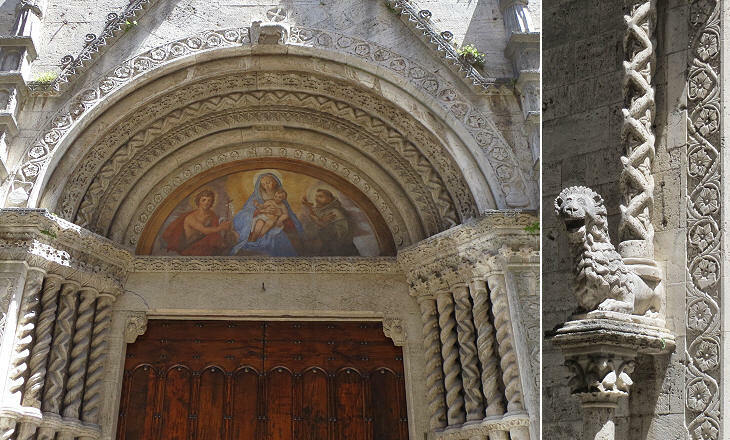 They were all erased in 1798 when Ascoli was occupied by the French. The only one which was spared was that of Pope Sixtus V who was born near Ascoli (you may wish to see some other coats of arms which were spared). The image used as background for this page shows the portal of the palace. The church is actually dedicated to St. John the Baptist, but because it belonged to a Franciscan monastery it is usually known as S. Francesco. Its construction started in 1258, but it was completed only in the late XVIth century with the dome and the two slender bell towers. This explains why different styles coexist in the same building. 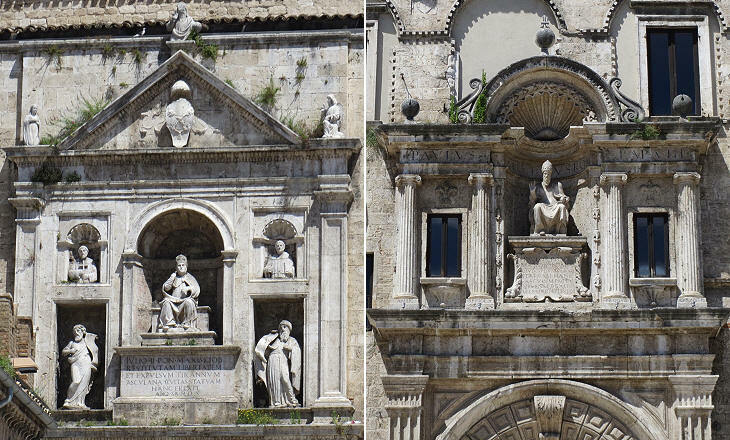 In general the Franciscans were not in favour of highly decorated churches, in line with the teachings of St. Francis of Assisi, but at Ascoli they made an exception and all the four portals have a very elaborate design, perhaps by Venetian sculptors. Guilds were a very important element of the economy and system of government of the Italian state towns. 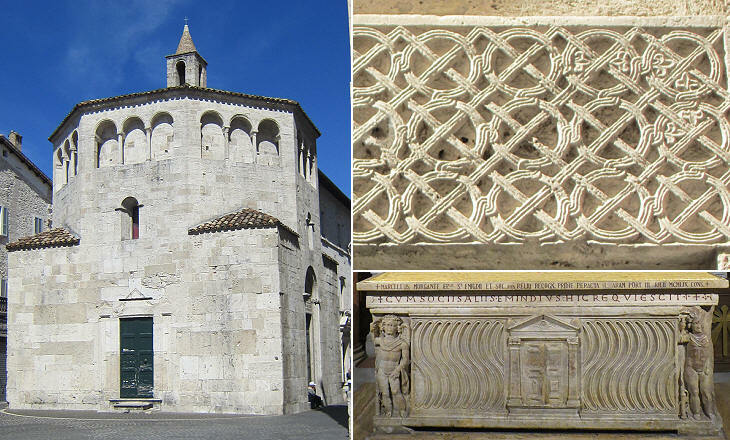 Arte della Lana (Wool Trade) was one of the most important guilds (especially at Florence) and at Ascoli it built a small loggia on one side of S. Francesco where its tradesmen could meet without using the public porches. 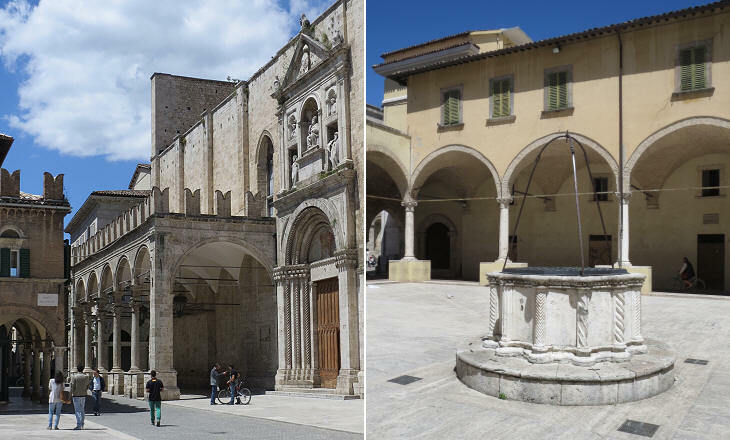 Ascoli has no historical fountains and very few wells. It is likely the inhabitants filled their jars with the water from the two streams (Tronto and Castellano) which almost surround the town. The ancient Roman aqueduct which supplied Asculum was rebuilt in the XIXth century. 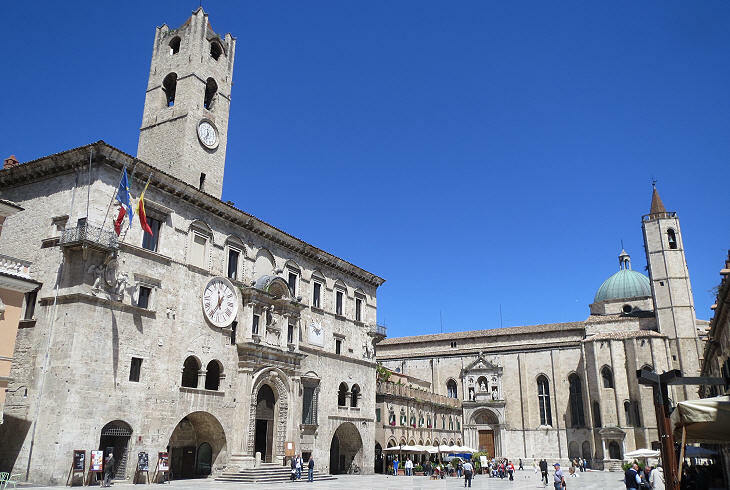 The second piazza of Ascoli is named after arengo, the assembly of the inhabitants of Ascoli during which they were harangued on public affairs issues. It is situated on the site of the ancient forum and it is more similar to other Italian main piazzas having as key monument the Cathedral. The Cathedral was built in the VIth century on the site of an ancient basilica and then enlarged and modified several times until it was almost entirely redesigned in the XVIth century. The nearby detached baptistery retains its XIIth century appearance; its octagonal shape is typical of Italian baptisteries and it derived from that of Battisterio Lateranense in Rome. The portal of the baptistery is decorated with an unusual relief where the geometric pattern is made less monotonous by a branch of ivy leaves. 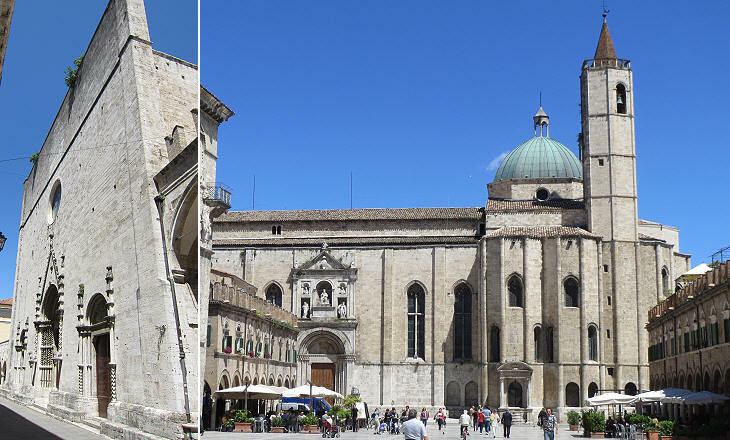 The Cathedral has a dual dedication: to the Assunta (the Assumption of Virgin Mary) and to St. Emidio, Bishop of Ascoli in the early IVth century and patron saint of the town (you may wish to see the church Ascoli dedicated to him after the town was spared by an earthquake in 1703). The Cathedral houses works of arts of different periods. 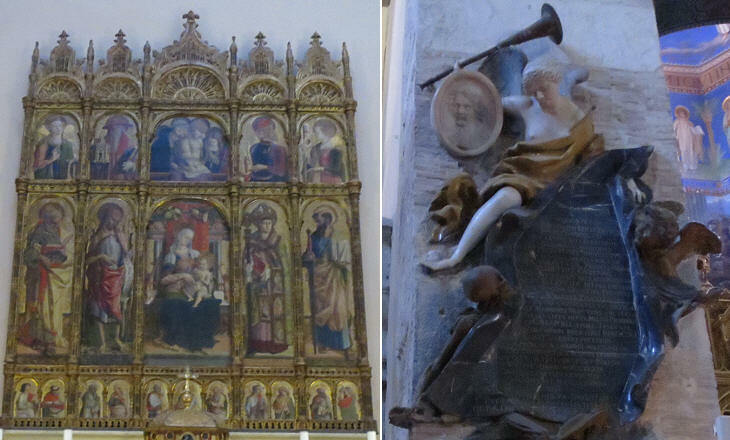 During the Early Renaissance Ascoli was visited by artists from Venice such as Carlo Crivelli, but later on the influence of Rome prevailed. Giuseppe Giosafatti (1643-1731) can be regarded as the Gian Lorenzo Bernini of Ascoli. He was an architect and a sculptor and a relative of Lazzaro Morelli, a sculptor of Bernini's inner circle. 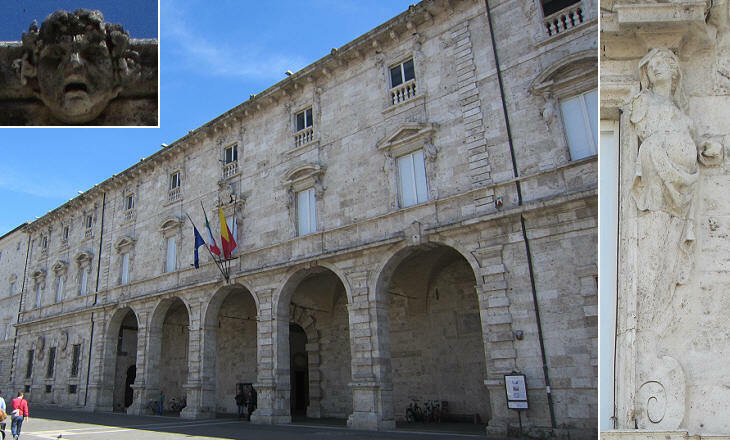 He redesigned Palazzo Comunale giving a new façade to two existing old buildings. The sculptures are by him and by his son Lazzaro.